I have often sung the praises of Cook’s Illustrated‘s Multigrain Bread, and I have made their “No-Knead Bread 2.0” more times than I can remember (I stopped making it after I decided it was too easy). Suffice to say, Cook’s Illustrated publishes great bread recipes, so when a new one comes out I take notice. In the latest issue there is a recipe for ciabatta. Ciabatta is a rustic bread with a big crumb, and since I am a fan of all things rustic and big-crumbed, I had to try it. Reviewing the article and recipe, most notable was how wet the dough is. 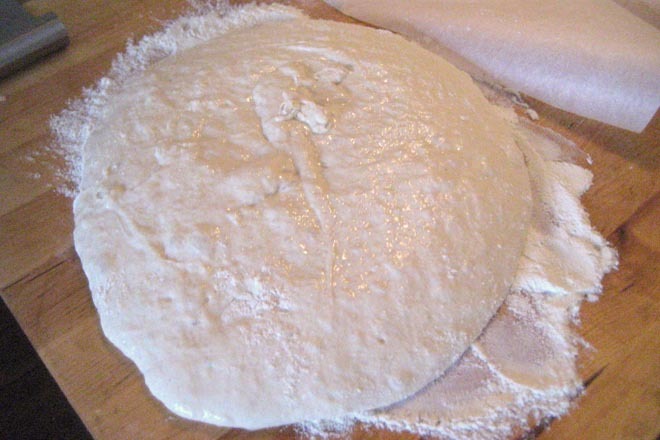 It calls for a starter with 5 oz of flour and 4 oz of water, and then a final dough of 10 oz of flour with 6 oz of water and 2 oz of milk (the milk inhibits gluten formation, preventing the crumb from getting too large). That’s 15 oz of flour and 12 oz of liquids, for a hydration of 80%. In my standard bread recipe I shoot for about 68% hydration, so this was ridiculously wet dough, practically batter! This makes kneading and shaping the dough very difficult. 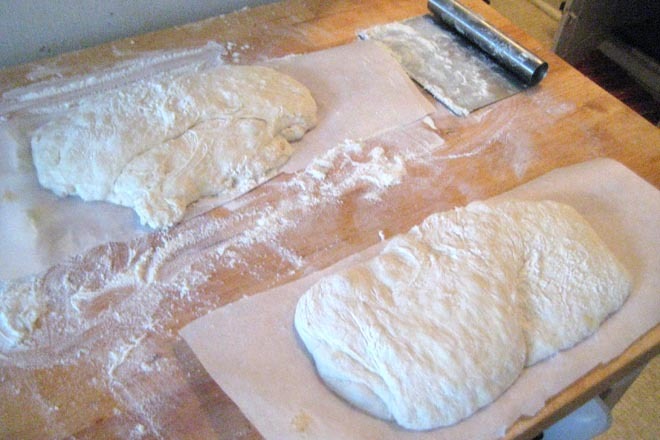 The key to shaping a dough this wet is using a lot of flour. I put a pretty thick bed of it on the board, poured on the dough, and then threw a few handfuls on top. This allows you to touch the dough without immediately having your hand sucked into the giant dough monster. In spite of all this flour it was still pretty difficult to contain the dough; eventually I wrestled it into two rough rectangles. 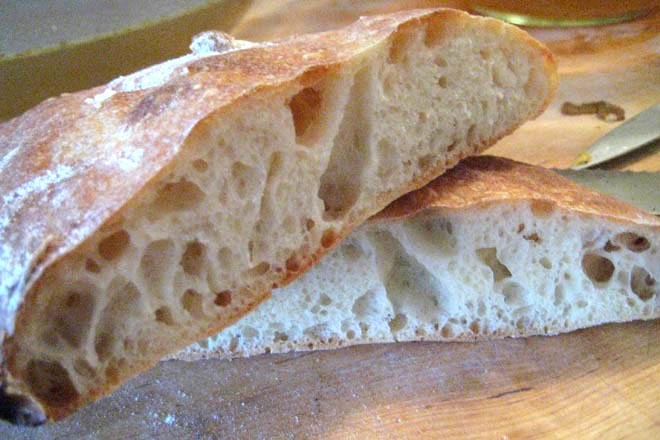 The bread was nicely crusty and but still soft and chewy, really a first-rate ciabatta. Without a stand mixer, it may be more of a hassle than it is worth, but if you do have a KitchenAid gracing your counter, I would recommend giving this recipe a try. UPDATE: In fact, this was so worth giving a try that I gave it another try. Still no mixer, but using less water during the mixing process made for an easier time with a consistent result. This entry was posted by Tom on Wednesday, February 25th, 2009 at 9:40 pm and is filed under Bread. You can subscribe to responses to this entry via RSS. The problem with the no knead bread recipe was that I felt like I was a machine. I could get really good, really consistent results, but I had no control over what was happening: I just followed the formula and let the magic happen. I much prefer my current method where I control every part of the process. There’s probably a lot of experimentation that I could do with the no knead recipe too, so maybe that’s a topic for future posts. Looks like great results. I must give it a try. Busy with grandpa at the moment. Received a great letter from Martha. that looks absolutely delicious, incredible texture. I would gladly tear my teeth into that, Tom. I just made this for the second time. I didn’t use as much water in the mixing and the dough was easier to work with, but I still think it would be chewier if I used a stand mixer. The crumb was just as great, but I think I like the crust a little crispier. Probably my fault for storing it in plastic.